Styling your living areas to be both beautiful and practical can be a challenge. Especially when you have to incorporate less pretty items such as TVs and speakers. I’m all for clever ways of integrating these things into the décor so that they don’t stand out or distract from the pretty rooms I want to spend time in. Panasonic got in touch with information about the Panasonic Waterproof Bluetooth speaker, a stylish small speaker that would seamlessly integrate into most spaces. It’s portable as well as waterproof which really appeals to me as I never seem to have plug sockets in the right place. We currently have some pretty ugly speakers which we are thinking about updating and this could certainly be a contender. Currently we’ve got our stereo, vinyl player and speakers housed on an antique sideboard, alongside a generous supply of plant babies. It’s pretty hard to make this area look less busy as we don’t have space to store this kit elsewhere, and we want to be able to listen to our records in the lounge. A friend of mine suggested that perhaps a preamp from a website similar to hifisystemcomponents.com might improve out listening experience even more by giving us the ability to downsize our speakers and get smaller ones while maintaining the quality of sound and lack of distortion. So I’ve been hitting Pinterest, to try and get inspiration for how to integrate speakers into home décor in a pretty but practical way. For anyone whose design philosophy is ‘go big or go home’ these hefty speakers might appeal. I think in this space they definitely work and add to the utilitarian, industrial vibe. Alas, they would be far too big and overpowering for my tiny boho lounge. 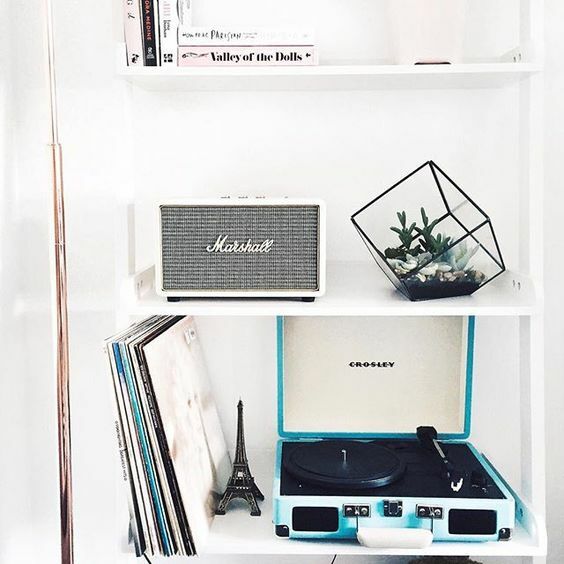 This vintage style speaker goes so well with their vintage style Crosley* vinyl player. This speaker/alarm clock combo seems to almost blend in with the neutral decor. It’s delicate enough not to draw too much attention which I think is key. 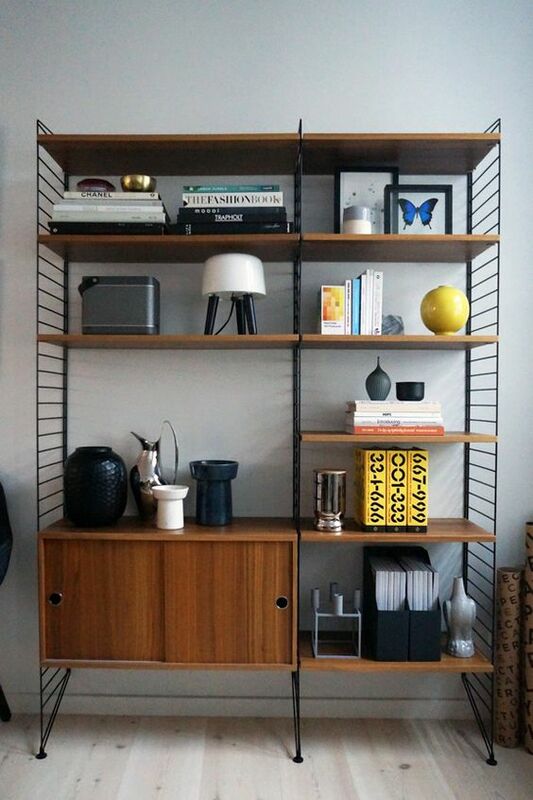 There’s something about mid-century shelving units – it seems like it’s impossible to style them badly. This unit has a portable speak on which fits in so well with the other shelf-occupants that it almost blends in. You could also easily imagine two wired speakers sitting here nicely. I love everything about this image. 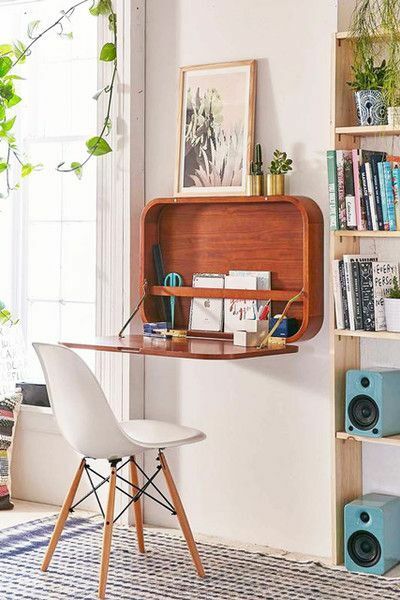 The Eames style Eiffel chair* the fold out wooden wall desk (with gorgeous rounded corners), the untreated wooden shelves and the blue speakers. Kind of makes me want to paint my speakers, hmmm will have to get the boyf on board for that one. 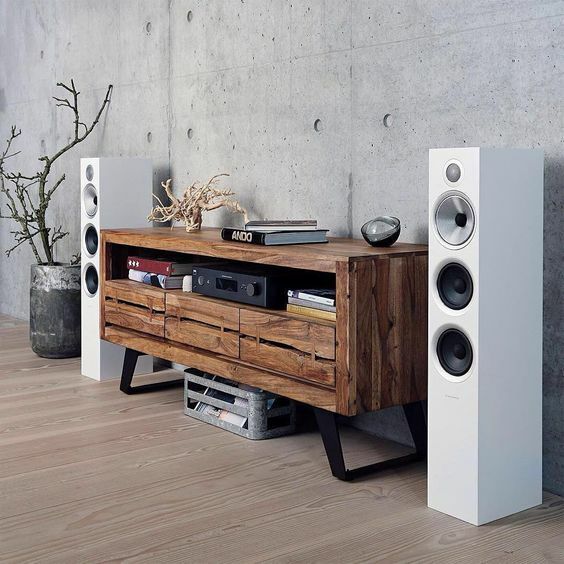 Again this image shows how if you style your shelves well the speakers almost blend in. This might be a bit busy for some but I think with the white walls and floor you can afford to have a more eclectic bookshelf. And here’s our sideboard set up. We don’t have a TV in the lounge as we both just watch on our laptops so this area, opposite the sofa, houses our vinyl player and stereo which is in near-constant use. I’ve dressed it up with some plant babies, candles and a demijohn full of fairy lights. So whilst it’s not the pretties set up it’s still in keeping with the rest of the room. While a sleek, miniature speaker like the Panasonic one might look better the the space, ultimately we’re stuck with these guys for a while and I think we’ve just about managed to make them a feature without being an eyesore. What do you think? How do you get around the design challenges of making the practical beautiful? Please note, this post was sponsored by Spot however, all words and opinions are my own. I only accept sponsored posts from brands I think fit with my blog and readership. Affiliate links are marked with *.